Thailand holidays are ideal for essentially any traveller. This lovely country boasts stunning landscapes, outstanding attractions and activities, and thriving, vibrant cities that come alive at night. Whether you are looking for a relaxing day on the beach, a mountain adventure, a jungle safari, or a visit to a beautiful city, it can be found in Thailand. Thailand is home to a significant number of Buddhist shrines, monasteries and temples, all of which are spectacular sites. There is also a seemingly endless number of restaurants, bars and markets. You can visit mesmerising cities such as Phuket, Koh Samui, Pattaya, Khao Lak, Chiang Mai and Bangkok, spend the day on one of the many lovely beaches in the province of Krabi, or visit Phuket Island with its breathtaking rock formations and colourful markets. Jungle safaris in Thailand are available as well, during which monkeys, eagles, reptiles and even bats can be viewed in their natural habitat. Each forest layer has its own ecological story, from the forest's floor to its canopy. This interesting world offers a one-of-a-kind experience, where you can glimpse leopards, jaguars, anteaters and other amazing creatures as they prowl through the thick, lush vegetation. Bangkok is regarded by many travellers as Thailand's top attraction. Because it is the centre of both commercial and cultural activities, it is a very diversified area, and the pulse of the city is friendly and romantic. Be sure to visit Bangkok's top attractions, such as The Grand Palace with its magnificent architecture and the Temple of the Reclining Buddha, also known as Wat Pho. If you are a shopping enthusiast, go to CentralWorld and enjoy its limitless number of shops, boutiques and live entertainment venues. Bangkok also boasts a broad range of dining options and a stimulating and engaging nightlife. Phuket is perfect if you prefer exotic Thailand holidays. Its famous shoreline includes the popular beaches of Kata, Karon, Rawai, Nai Harn and of course, Patong. There are also attractions such as the Karon Bazaar, where you can shop for essentially any item you desire. Guided tours of Phuket's inland regions are also available if you are feeling adventurous. If you love the sea, Kho Phi Phi Ley Island is ideal. The Island boasts a picturesque landscape featuring sandstone cliffs, clear waters and white sand. Renowned for its coral life, the Island is perfect for diving, snorkelling and scuba diving. You will also find incomparable photo-opportunities on this lovely Island. If you want to interact with natives and learn about other cultures on your Thailand Holiday, consider a trip to Chiang Rai. Here, you can visit tribal villages, where beautiful music, impressive handicrafts, and dramatic, colourful dances can all be enjoyed. These tourist-friendly communities pleasantly interact with holidaymakers, and even offer advice about attractions and activities. In addition, you can go hiking, commune with elephants, discover impressive waterfalls and enjoy many other sights and sounds in this unique region. If you enjoy modern cities with shopping malls, skyscrapers and a thriving atmosphere, Chiang Mai is the place for you. Considered the best of both worlds, this lovely region is also home to over 300 temples and pagodas, as well as an unspoiled landscape which can be viewed during a fun and educational jungle trek. There is really no bad time for holidays to Thailand, but if you plan to visit the Western Peninsula, you should book your trip sometime between November and June. However, Eastern Thailand offers its best weather from December to May. If both coasts are on your itinerary, schedule your holiday sometime between December and April. The southern part of Thailand does not experience winter, and winters in the North and Northeast are cool, dry and pleasant. However, temperatures as low as 0°C may be experienced in the higher elevations. Thailand holidays are not complete without some authentic Thai cuisine. The elements in most dishes are sweet, sour, and spicy. Consider indulging in various fish and meat dishes, noodles, vegetables and soups. You can also sample takeaway snacks from one of the area's many vendors, and these include salads, raw vegetables with dipping sauce, satay and sweet dishes. Because Thai chefs strive for perfectly balanced flavours, virtually anything you choose is sure to be tasty. Holidays to Thailand offer something for travellers of all ages and from all walks of life. Picturesque landscapes, guided tours, vibrant cities and a glimpse into the life of natives all create a memorable Asian experience. With a little time and effort, you can organize an unforgettable holiday to this beautiful and captivating country. 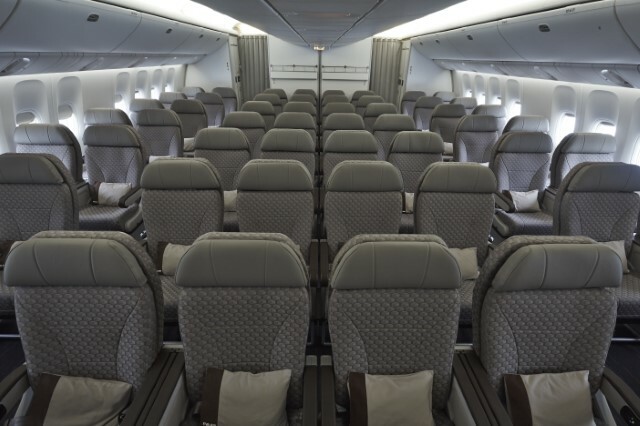 Choice of three classes of cabin service: Royal Laurel Class (complete flat bed Business Class), award-winning Elite Class (Premium Economy) and Economy Class. Personal seat-back, state-of-the-art touch screen audio/video on demand entertainment systems are installed in all three cabin classes. 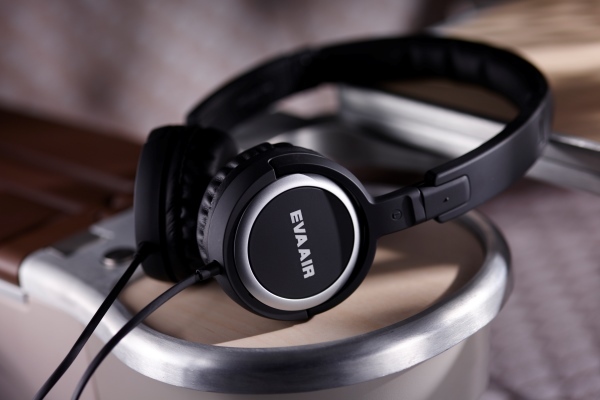 EVA Air has a global network serving over 60 destinations throughout Asia, America, Australia, and Europe. EVA Air was the first airline to introduce an Elite cabin (Premium Economy Class) to the UK market. EVA Air is an award winning 5 star airline awarded by SKYTRAX as well as the 6th Safest Airline in the world for 2017 (by Aero International); and No. 1 airline for World’s Cleanest Aircraft Cabins 2017; and the Best Business Class Comfort Amenities 2017. 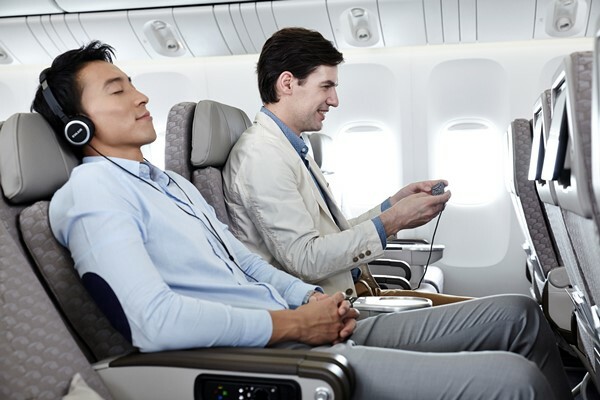 The Elite Class on EVA Air's B777-300ER aircrafts ingeniously satisfies both leisure and business flyers. The cabin is simply yet stylishly laid out with a refreshingly elegant color palette that matches your taste. Your private space in the cozy, spacious Elite Class features a high efficiency, exquisitely modern seat that guarantees total relaxation whether you are flying for business or leisure purposes. Combining contemporary aesthetics with functionality, the plush and spacious Elite Class offers you a 38 inch long, 19.5 inch wide seating space with ample leg room. The ergonomically engineered chair and "Mood Light" lighting system will ensure that you enjoy good quality sleep with ultimate comfort. Enabled by the whole new Global Communication Suite (GCS), our convenient EVA Wi-Fi and SMS roaming services keep you updated on business even at 30,000 feet. Enjoy wireless internet connection throughout a business trip in the air. Fresh, healthy seasonal and cross border delectable food is served with select red/white wines, prestigious beers or non-alcoholic drinks to quench your thirst for the best ingredients and tastes. The Elite Class exclusive set also indulges you in a visual and gastronomic feast at a height of 30,000 feet. 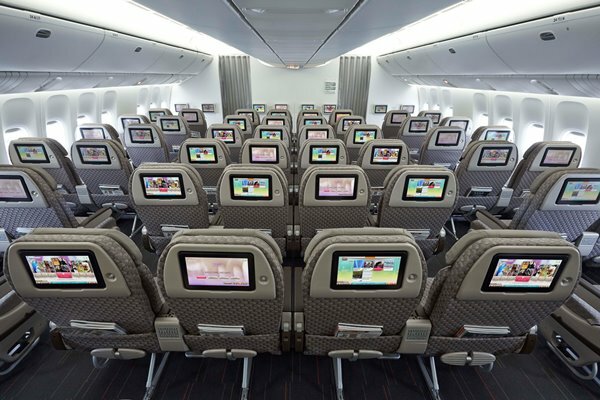 *The interior specification/amenities of B777-300ER aircrafts may vary from aircraft to aircraft.